Over the past few days, there's been a Change.org petition circulating to expand the privileges of volunteer firefighters and EMS personnel who use "courtesy lights". Here in PA, those lights are blue (and ONLY blue) and give you NO legal right to do anything more than an average driver. In all my years in Fire/EMS, I've never used blue lights to respond to a call or a firehouse. Many of my volunteer originations have staffed the station in readiness for calls, and I've had no desire to spend money on lights for my car. Anyway - the petition is here: https://www.change.org/p/pennsylvania-general-assembly-change-the-laws-regarding-volunteer-firefighters-courtesy-lights-in-pennsylvania - it calls for volunteer vehicles with "blue lights" to get the rights and privileges of emergency vehicles, and be able to use sirens/horns as warning devices too. Yesterday, I was driving eastbound on the PA Turnpike. As I passed the Mid-County interchange (76/476) in moderate traffic, this yellow BWM zipped past me in the shoulder with a blue dash light. He then proceeded to weave in and out of the exit lane, causing at least one car to have to swerve to miss him. 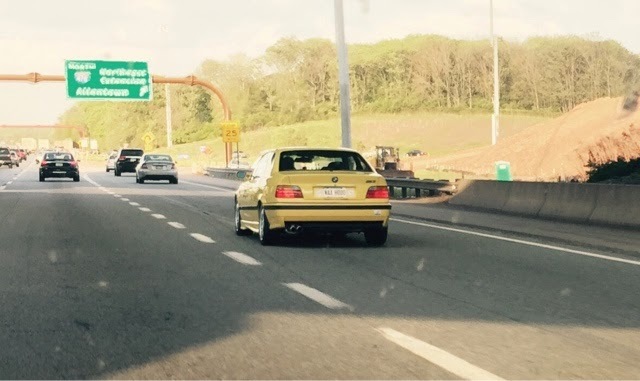 He then continued east on the Turnpike, again driving on the shoulder (next exit was miles away). I don't know what the crisis was, but I can't fathom why s/he needed to drive like that, risking multiple accidents. There wasn't an accident on the Turnpike - just typical rush-hour traffic. Anyway - to those who swear by blue lights, this is your enemy too - s/he makes everyone look bad. Further - think - will your community be safer with moreemergency vehicles driving around for the same number of calls?